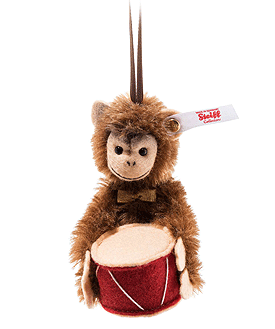 Jocko Monkey Ornament by Steiff. A beautiful limited edition Steiff item. Hand made in brown mohair and wool felt, Jocko Monkey holds his Wool Felt drum. He has brown ribbon attached to his head, so he can be hung. This limited edition piece has the white ear tag and the famous Steiff trademark - gold plated. Button in Ear. 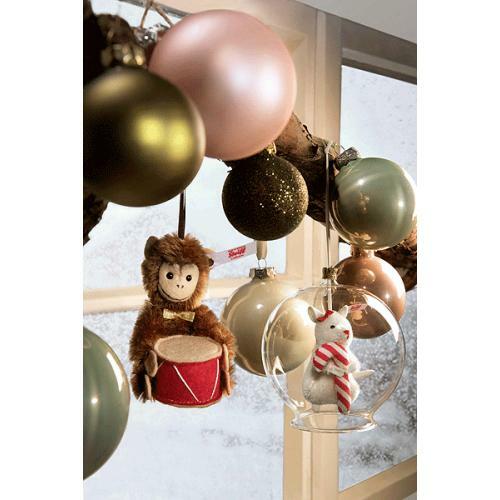 Steiff ornaments are among its most ornate creations. This year, Jocko monkey ornament invites his friends to a Christmas concert. With his button eyes, tousled and wispy mohair coat and big red drum, he never fails to raise your spirits. We can just imagine the drum roll … and who needs a gift wrap ribbon when you have a gold Lurex bowtie? !